Florence is full of art and architecture. Some may even say, it is oversaturated. This “blossoming” city made a grand contribution to the development of European civilization. Therefore, every self-respecting traveler should certainly pay a visit to this place. The sights of Florence will win anyone’s heart. There is always something to see, capture and admire. 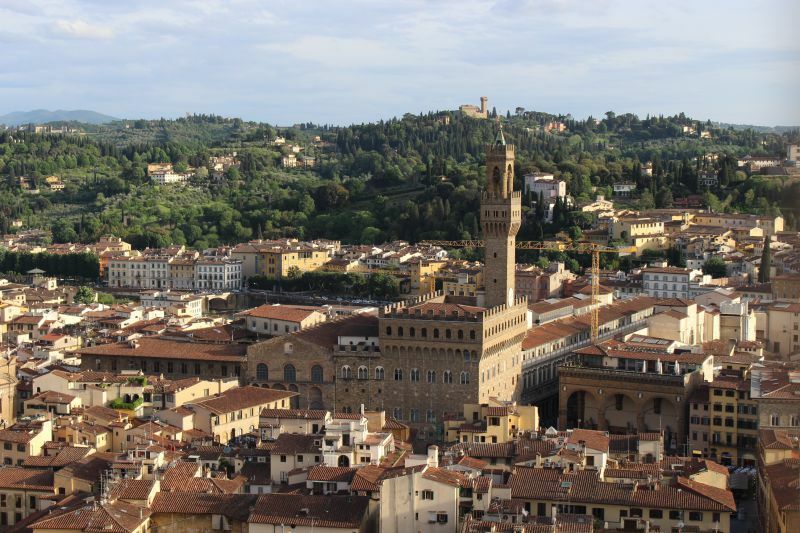 We offer you a brief tour of the most amazing historical must-see spots in Florence. Temples and cathedrals – local citizens’ pride and popular tourist attractions – can be found in every ancient Italian city. Here, in tender Florence, you will see the grandiose cathedral, the ancient baptistery, the medieval bell tower and lots of historic churches. 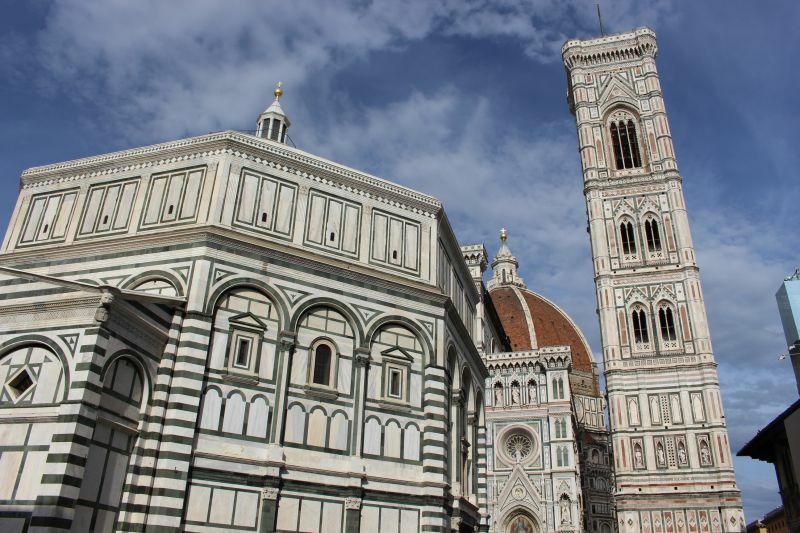 The soul of the city is its Florence Cathedral or the Cattedrale di Santa Maria del Fiore. This is one of the five most impressive temples in the world and it has been standing proudly on Piazza del Duomo for seven centuries. Its size and façade made of multicolored marble among which there are a lot of sculptural compositions are striking. Photo by: Oleksandr Safronov IGotoWorld Photo Group. The interior of the cathedral in the style of the Italian Gothic – with its inherent numerous arches, aisles, lancet vaults, and pilasters. The best Italian sculptors of the 16th century worked on the marble floor. While referring to the enormous size of the temple, it should be mentioned that it can accommodate up to 30 thousand people. The terracotta dome has a unique design, you can see it from the inside during the tour. Admission: free. 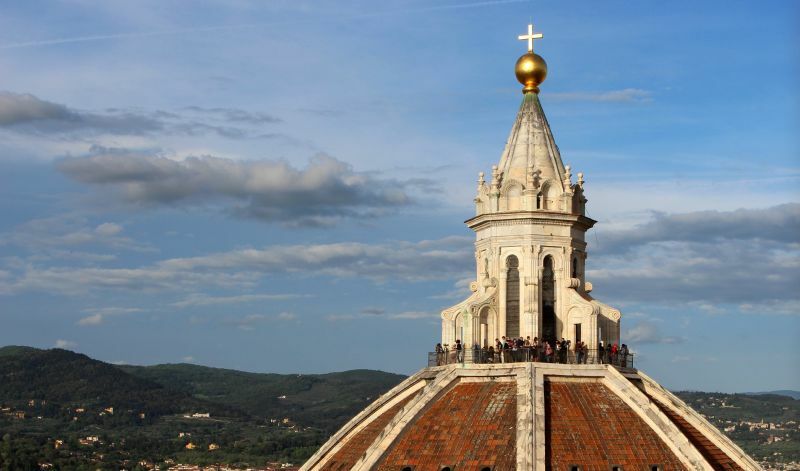 You can visit Brunelleschi's Dome, Giotto's Campanile, the Opera Museum and the Baptistery of Saint John for 18 euros. from Monday to Saturday – from 10:00 to 16:30. How to get: take bus C1 to the Studio stop. The Florence Baptistery is the most ancient structure of the city; it is located near the Cathedral of Santa Maria del Fiore and Giotto's Campanile. The building has been preserving its original design since the 13th century. For centuries it was the place where the Florentines were baptized. The eastern door of the baptistery draws the most attention. The great Michelangelo called this artwork made by Lorenzo Ghiberti "Gates of Paradise." 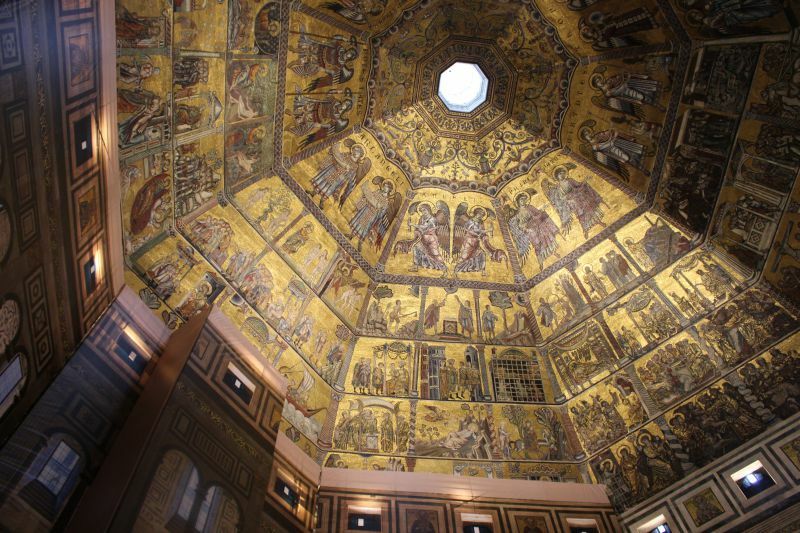 Unfortunately, only a copy of the gate was installed in the baptistery, the original can be found in the Opera Museum. The dome decorated with fantastic frescoes also catches the eye with its magnificence, or the depictions of the Last Judgment, in particular. The sculptures created by Donatello are put on display inside the Baptistery of Saint John. Opening hours: from 08:15 to 10:15 and from 11:15 to 19:30. Admission: you will have to purchase a full ticket for 18 euros. This ticket allows you to visit Brunelleschi's Dome, Giotto's Bell Tower, the Opera Museum and the Baptistery of Saint John. It is valid for 24 hours after visiting the first attraction. The gothic bell tower at the Cathedral of Santa Maria del Fiore was built in the 14th century by the design of Giotto di Bondone. That’s where the name came from. 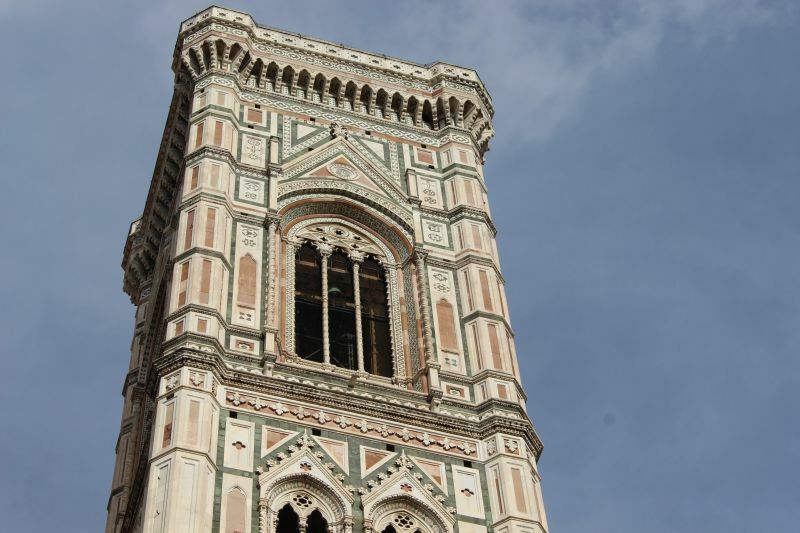 Giotto's bell tower is known for its beautiful marble inlay works and rich sculptural decoration. One of the main sources of pride for Florence. Opening hours: from 08:15 to 19:00. Please mind that to climb the tower, you will need to use the stairs with 414 steps as there is no elevator. View from the tower. Photo by: Oleksandr Safronov IGotoWorld Photo Group. Admission: you will have to purchase a full ticket for 18 euros. This ticket allows you to visit Florence Cathedral, Brunelleschi's Dome, the Opera Museum and the Baptistery of Saint John. It is valid for 24 hours after visiting the first attraction. While walking along the medieval streets of Florence, you will encounter many sights created by great masters like Andrea Pisano, Arnolfo di Cambio, and many others. For the most part, those are just replicas, the originals are kept in museums. That is why it is worth visiting the museums of Florence. 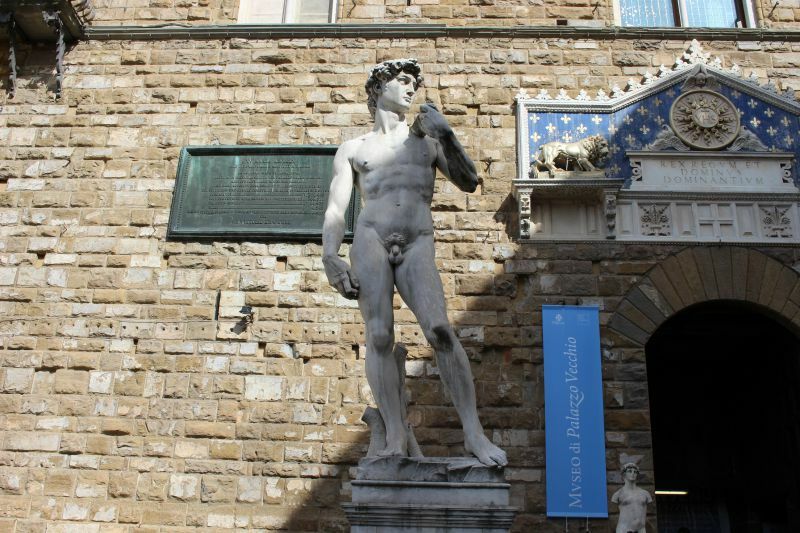 For example, the marble sculpture “David” by Michelangelo is exhibited at the Florence Academy of Art, and its copy is located on Piazza della Signoria in Florence, at the entrance to the Palazzo Vecchio. 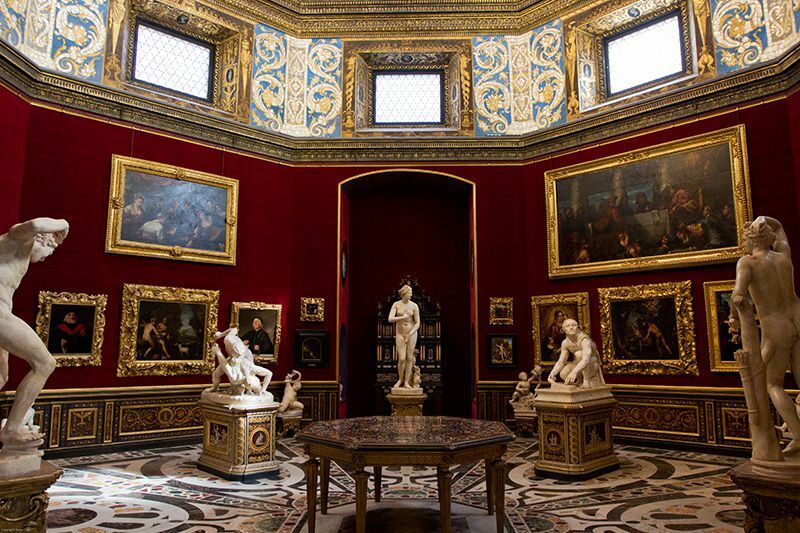 One of the richest galleries in the world can be found in the center of Florence. The Uffizi Gallery is a unique place considering the full value of the artworks displayed inside. Most of the collection dates from the 12th to the 17th century. The Uffizi Gallery is just as popular as the museums in Vatican City. And there’s a reason for that. 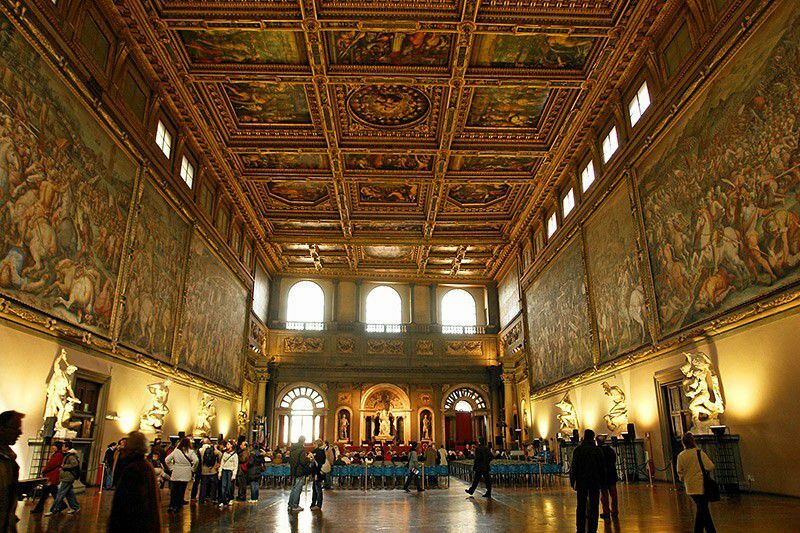 There are the works of Leonardo da Vinci, Michelangelo, Raphael, Rubens, Rembrandt, Botticelli and many other famous masters exhibited in its halls. The gallery is located in a huge building which had been under construction since 1560 and was designed by the noble architect Giorgio Vasari. Not only the collections but also the building of the Uffizi Gallery is considered to be the most valuable treasure. Opening hours: open daily, except for Monday, from 08:15 to 18:50. Admission: 20 euros, in winter 12 euros. There are always long queues at the gallery, you can book a ticket in advance on the official website. 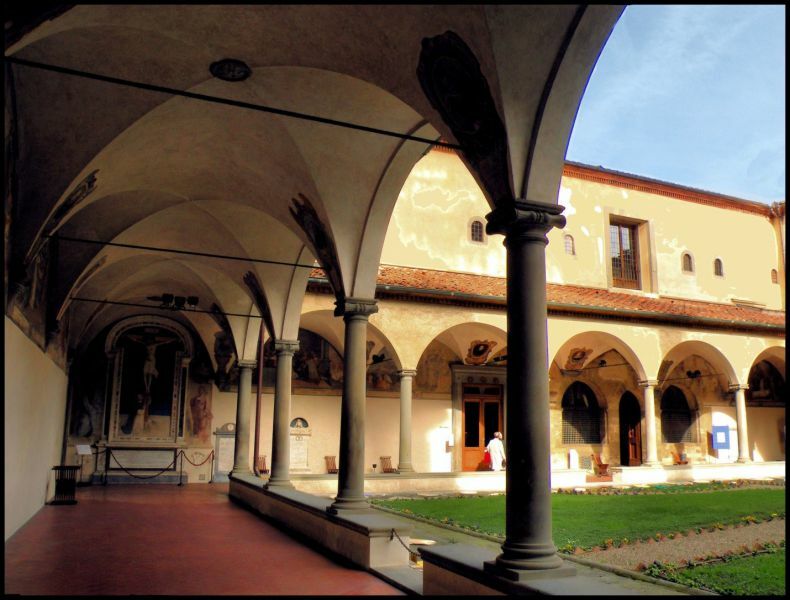 The former Dominican convent of San Marco was expanded and has been a national museum since the 19th century. This is a deeply religious place that has a history and amazing atmosphere. Such famous religious figures as Savonarola and Fra Angelico dedicated their lives to God here. The artworks of Fra Angelico are given a special place in the museum. His frescoes decorate the monastery from the inside. All the master’s works are dedicated to the Virgin, Jesus Christ, and the saints. They were created within inside the convent and were never moved anywhere else. Among the most famous works, there is the “Annunciation” of 1438, the fresco by Ghirlandaio “The Last Supper”, “The Crucifixion” and the altar image “The Madonna with saints”. Another valuable piece of San Marco is the arcade of San Antonio created in the 15th century. In the convent, you can go to the first public library of the Renaissance and see a rare collection of manuscripts. Opening hours: Monday through Friday from 08:30 to 13:50, on weekends – till 16:50. How to get: by buses № 6, 14, 23, 31, 32 to the Museo Di San Marco stop. Luxurious palaces are the highlight of the capital of Tuscany. There is a lot of them here. And every each one of them is certainly something to behold while taking in every little detail of fancy interiors and unique architectural decisions. The old Florentine palace built in 1299–1314 is located on Piazza della Signoria. The Palace of Signoria, as it was called before, is a real architectural pearl. Its courtyards, the Hall of the Five Hundred, adorned with 16th-century frescoes, the Guardaroba and the Chapel of Signoria. All these names carry a huge amount of valuable historical heritage. There are also legends about the interior. The frescoes located inside the Palazzo Vecchio, in the Room of the Elements, are insanely striking. In the Guardaroba you will find the ancient enormous globe and 53 geographic maps created in the 16th century. The Terrace of Saturn offers spectacular views of the historic part of Florence. Opening hours: from Friday to Wednesday from 09:00 to 19:00, on Thursdays – until 14:00. Admission: a full ticket to the museum costs 10 euros, a reduced one – 8. 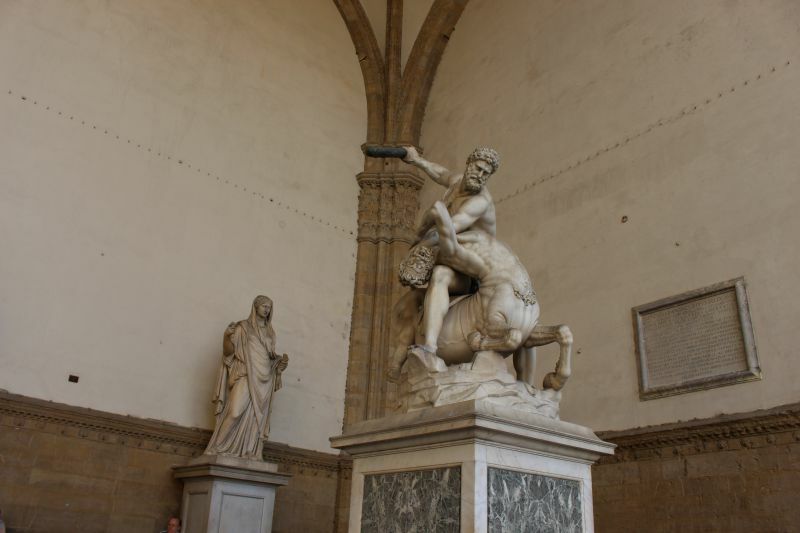 How to get: Piazza della Signoria is located in the center of Florence. The nearest public transport stop is Galleria Degli Uffizi (bus C1). 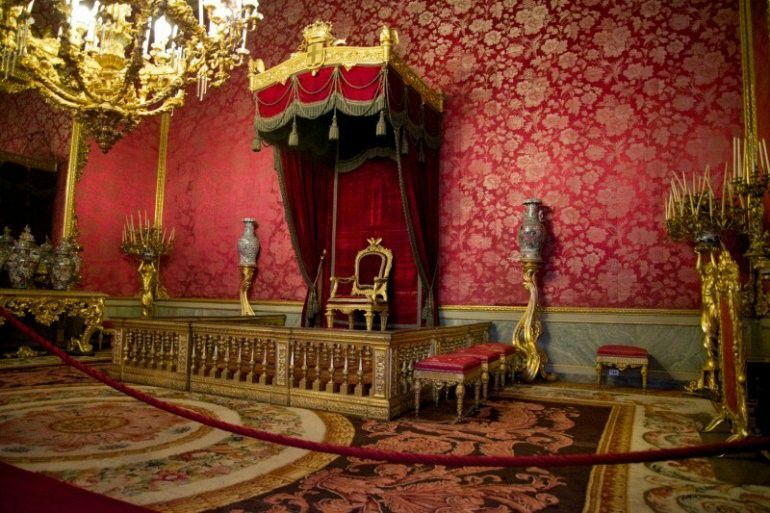 This is another grandiose palace of Florence that is considered to have the richest decorations. Most of all, it impresses with its incredible mightiness, then the interiors come into sight. The building is an outstanding architectural landmark. Palazzo which was named after the banker Luca Pitti who organized its construction served as the residence of the Dukes of Tuscany, the Habsburg-Lorraine and Medici families, and the Italian kings. The size of the Palazzo Pitti is astounding. Each of the three floors is 10 meters high. We must give it to the architects taking into account that construction was started in 1458. Nowadays, the palace houses the museum complex which includes the Palatine Gallery, Silver Museum, Modern Art Gallery, Porcelain Museum, Carriage Museum, and the Costume Gallery. Visitors will find the number of artworks of great masters, amazing frescoes, priceless pieces of past eras and other objects that indicate the power of the aristocracy quite shocking. Opening hours: daily, except for Monday, from 08:15 to 18:50. It will take several days to fully explore the entire complex. Admission: the ticket can cost from 5 to 38 euros depending on the number of museums. It is valid for three days and includes a visit to the Boboli Gardens. How to get: take the C3 or C4 bus to the Pitti stop. The Palazzo Medici built in 1460 is recognized as the prime example of the early Renaissance architecture. It draws attention with its simplistic, sober, but a very elegant three-tiered facade. The most famous place of the palace is the Magi Chapel of 1459. It’s two small rooms one of which is the altar. The chapel is decorated with a carved wooden ceiling, gilded frescoes, and a marble floor. The Palazzo Medici houses the city prefecture. Some rooms are still open to the public. Opening hours: every day, except for Wednesday, from 09:00 to 19:00. How to get: by buses № 14, 23, C1 to the Via De 'Pucci stop. A three-story simple-looking palace can be found in the center of Florence. 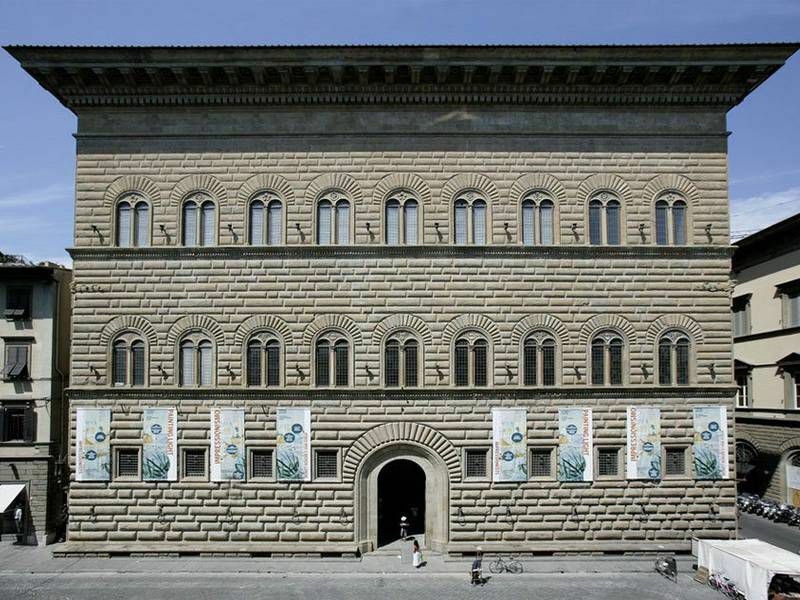 This is the Palazzo Strozzi built in 1539 for family members. The palace doesn’t have the fanciest design, however, it is quite big in size. It is a rectangular building with an elegant courtyard, decorated with antique columns. Today, the Palazzo Strozzi is simultaneously a Renaissance architectural landmark, an exhibition hall and a center for all kinds of cultural events. The place is divided into three zones. Interesting events take place in Piano Nobile, the Centre for Contemporary Culture Strozzina is located on the second floor, and cafes, snack bars, and souvenir shops can be found in the courtyard. Opening hours: daily, except for Mondays, from 10:00 to 20:00. On Thursdays – till 23:00. Admission: a full ticket will cost 12 euros, reduced one – 9.50 and 4 euros. How to get: by public transport to the Stazione di Santa Maria Novella, Piazza del Duomo, Via Tornabuoni or Piazza della Repubblica stop. Many buildings that survived to this day are especially valuable because of their age. Among them, there are those who seem to be completely unaffected by time. Of course, you have to visit them. The Basilica of St. Lawrence is one of the largest ancient churches of Florence. It was built back in the 4th century, the last time it was modified in the 15th century. The temple is full of religious artworks. Among the main treasures, there are two cathedrals and a sacristy made by Donatello, the sarcophagus of Pietro and Giovanni Medici which was created by Verrocchio, and the Medici gravestones decorated by Michelangelo. The members of the Medici families rest inside the church. The church exterior may not be the best but as soon as you go inside, the first impression significantly improves. 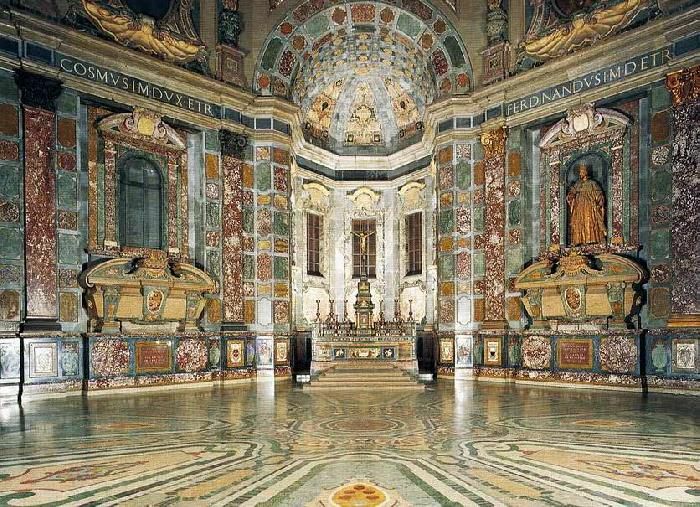 You should also definitely visit the Chapel of the Princes and visit the Laurentian Library. Opening hours: every day, except for Sundays, from 10:00 to 17:30. Admission: 6 euros. On Sundays, you can attend Mass for free. How to get: take bus № C1 to the Piazza Di San Lorenzo stop. This is a part of the ancient fortress walls of Florence. From this gate once began the road leading to Rome and Siena. It was built in the 13th century. It dates back to the times of medieval Florence which can be confirmed by a marble plaque of 1327with inscriptions in Latin. Wooden gate doors with large old locks survived till this day as well. How to get: the Roman Gate is located between Via Romana and Via dei Serragli. The Boboli Gardens can be seen behind them. Built in 1345, Ponte Vecchio remained unchanged throughout its existence. During the Middle Ages, butcher shops were opened here, and ever since the bridge had been known as the most “foul-smelling” place in Florence. Now this famous landmark where trade rapidly grows to this day, now mainly focused on jewelry which is why it is now called “the Golden Bridge”. 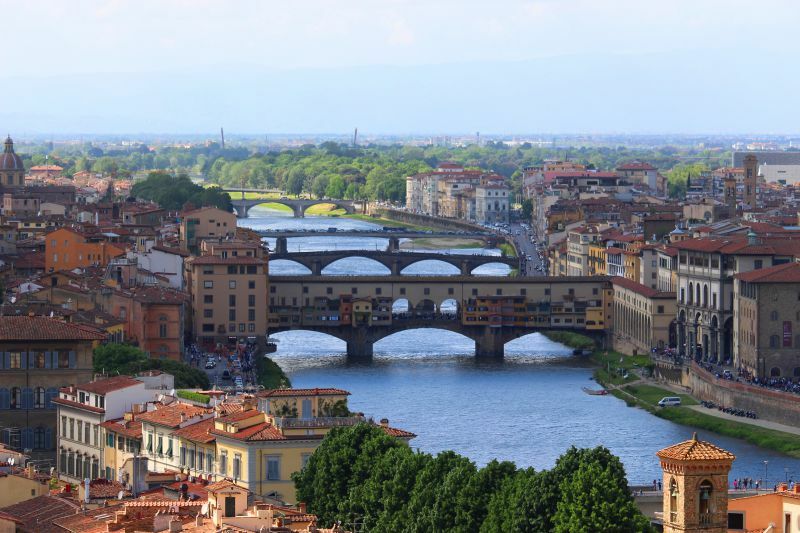 How to get: Ponte Vecchio is located at the narrowest point of the Arno River, not far from the Uffizi Gallery. If you focus on historic places while traveling in Florence then you should not deny yourself the pleasure to relax and eat in the oldest and most popular cafe in the historic part of the city. Rivoire was founded in 1872. And since then it has remained a very popular place among notable personalities and high-ranking officials. The place produces own chocolate of excellent quality. 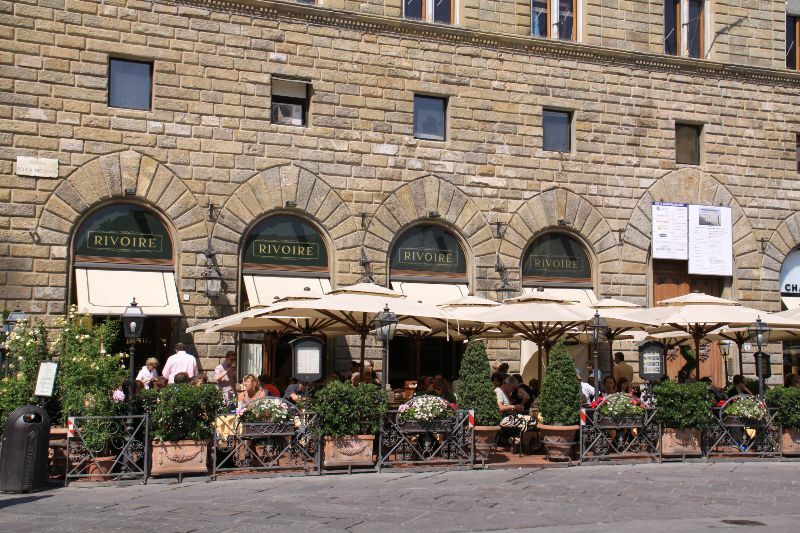 How to get: Cafe Rivoire is located on Piazza della Signoria, near the famous Uffizi Gallery. You can complement your trip to Florence with a few more scenic spots which any experienced tourist can recommend. The most photographed place in Florence is, of course, Piazza della Signoria. The old square that even lived through the fires of the Holy Inquisition is today a real historical museum. It is full of valuable sculptures – you can discuss their history and originality endlessly. In the center, you will find the famous fountain of Neptune. Florentines call the white marble figure of the sea god “Il Biancone” which means "white giant." David (a replica). Photo by: Oleksandr Safronov IGotoWorld Photo Group. It gets even more interesting. 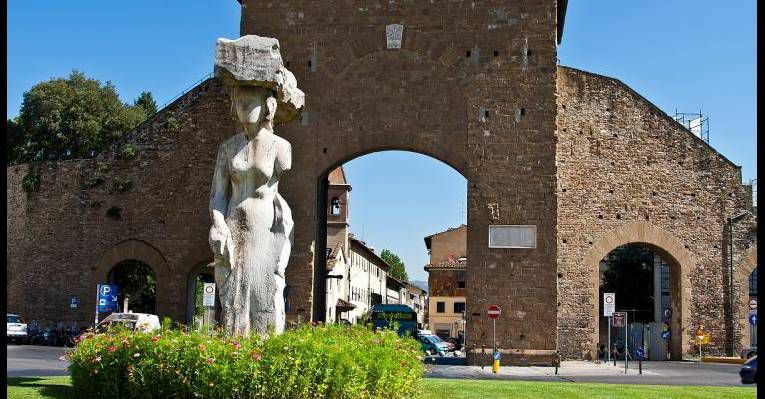 The next thing you will encounter is the equestrian monument of Cosimo I Medici made in 1594, “Judith with the Head of Holofernes” by Donatello, the lion with the shield “Marzocco”, a copy of the famous “David” by Michelangelo, “Hercules and Cacus” by Baccio Bandinelli and others. All these highly artistic masterpieces that decorate the area have no analogs in the world. The Palazzo della Signoriais located on the Piazza della Signoria as well; it is mostly known as the Palazzo Vecchio. Here you can also see the Loggia dei Lanzi built in 1376–1382 for meetings of the Florentine Republic. How to get: Piazza della Signoria is located in the heart of Florence. The nearest bus stop is Condotta (route C2). 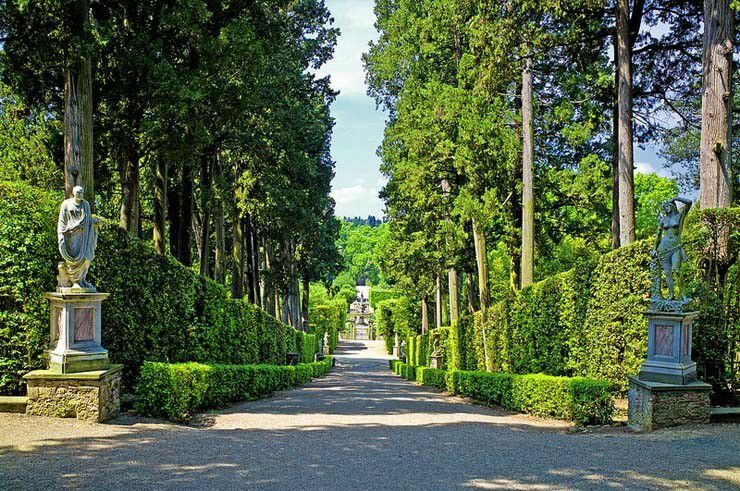 To take a break from the tour of the noble Florentine palaces, you can mix it up a bit and walk through the famous Boboli Gardens. 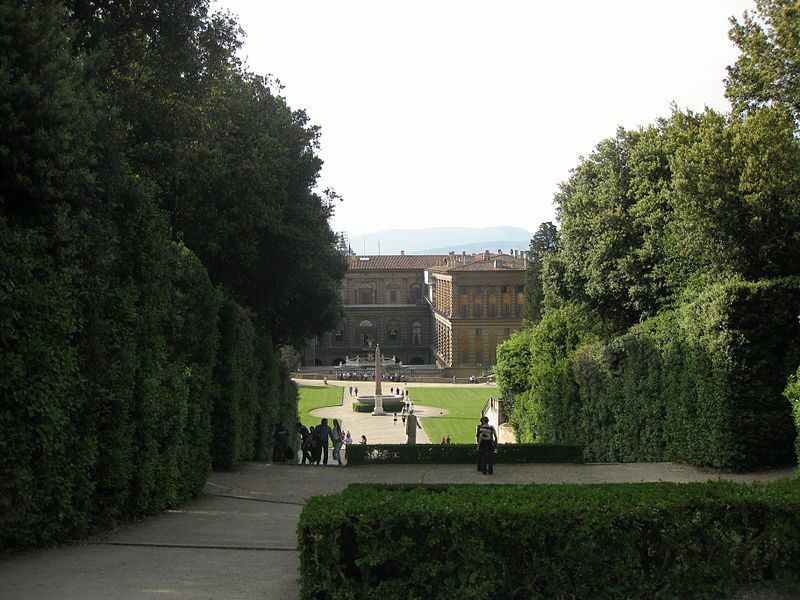 This unique park with old trees, old sculptures, and fountains, lies behind the Pitti Palace. The first record mentioning gardens dates back to the 16th century. They were opened to the public in 1766. Fancy receptions, theatrical performances were held here, the first time opera was demonstrated in these gardens. Anyone can wander here, in the shadow of the twisting alleys, among the echoes of the centuries. Opening hours: every day, except for the first and last Monday of the month, from 08:15. Closing time varies depending on the month. Admission: a full ticket costs 10 euros, reduced one – 5. A complex ticket with a tour of the Palazzo Pitti costs 38 euros. Selling food and drinks in the garden is prohibited, so it is better to grab yourself something for lunch beforehand. How to get: by bus № 11 to the Calza Romana stop. 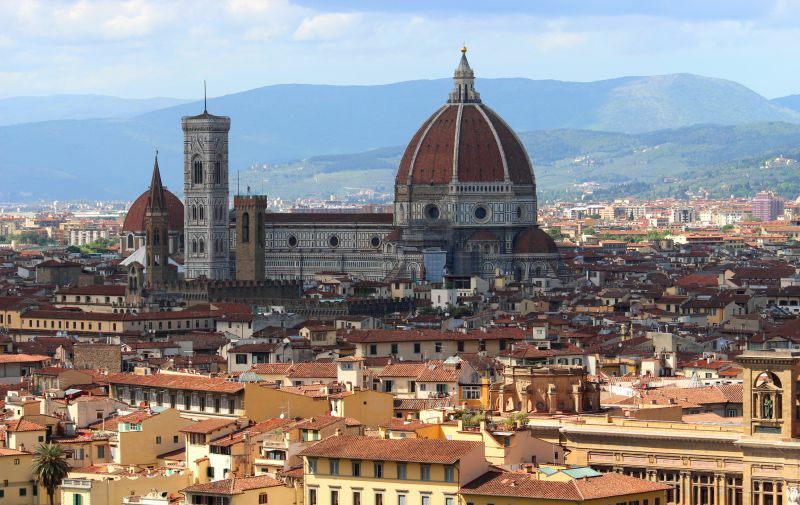 If you plan to take as much out of your trip as possible and stay in Florence for a few days, you should carefully choose your place of residence. We recommend you to choose a hotel based upon its proximity to the desired attractions, price-quality ratio, parking lot availability and so on. Hotel Santa Maria Novella is located near the train station. 7Florence B & B, Villa in Florence Area V, Hotel Palazzo dal Borgo, Florence Station Rooms and others are located in the city center. In the Santa Maria Novella area, there are the Grand Hotel Baglioni and Hotel L'Orologio. In the Piazza Ognissanti area, there is a fashionable hotel called “The Westin Excelsior”. Hotel Pierre and Fh Hotel Calzaiuoli, Hotel Duomo Firenze, Granduomo Charming Accomodation, Tourist House Ricci and others are located around Duomo. You can also stay at the Relais Piazza Signoria, Palazzo Uguccioni Apartments which are near Piazza della Signoria.